“… The republican government in Valencia has emerged victorious and has broken the power of the anarchist elements and has put an end to their influence in order to construct a disciplined and stable army, and now this policy is also being implemented in Catalonia. Señor Companys and the Generalitat have attempted to enforce the Decree ordering the disarmament of the extremists of the libertarian movement, a Decree that had previously existed only on paper. The anarchists, whose power is centered in Barcelona, where they are the most formidable armed force, responded immediately by disarming individual Assault Guards. This was the beginning of the street fighting and its first result was that the government was forced to turn to the anarchist leaders, to reach an agreement and enforce disarmament. Then the Government in Valencia agreed to intervene to maintain order and took control over police operations. General Pozas assumed command over the armed forces of the Generalitat. The Government also sent motorized units and dispatched three warships with the mission to go to Barcelona and help enforce disarmament….” (Le Temps, May 8, 1937). The events in Barcelona were the beginning of a new stage in the struggle between the Revolution and the Counterrevolution. The phrase “Antifascist Unity” stands unequivocally discredited for anyone who wants to open their eyes. Nothing good can be expected from a united front between the bourgeoisie and the proletariat, and certainly not in Spain. For the first time in the era of the Popular Front the two kinds of capitalist order have come face to face. The question of power in society has been clearly posed. This struggle for power has provisionally concluded without having produced a final solution. The workers have been persuaded by the leaders of their organizations to abandon the struggle. They managed to get them to yield with promises and insignificant concessions. All the positive gains of the workers have been minute in comparison with what has been obtained by the bourgeoisie. Generally, the bourgeoisie is devoting more effort to dismantling the positions of workers power in the rearguard than it is at the front, where it has also clearly revealed its counterrevolutionary face, not only continuing to pursue the policies from before May 3, but even exacerbating them. Government power has been reinforced by having concentrated the principal economic and military positions in its hands. The disarmament of the revolutionary workers has begun and their persecution has commenced. The result of the events of May 3-5 is the reinforcement of the positions of the bourgeoisie to the detriment of the proletariat. But the struggle is not over yet, and the proletariat has not only suffered setbacks. The workers have certainly yielded ground, without being completely defeated. They have lost many material positions but their conflict with the bourgeoisie has become more acute. Although the bourgeoisie has enjoyed some successes with the help of its lackeys, the greater part of the proletariat has lost its faith in a free and democratic Spain. Although the situation is becoming more difficult with each passing day, the revolutionaries in Spain always preserve a favorable battlefield. The increasing persecution of the revolutionary forces in Spain is proof not only of the growth of the counterrevolution but also of the growth of revolutionary consciousness. “…The Spanish proletariat, which conquered power, has encountered no significant solidarity from the world proletariat at the present time. The democratic imperialists do not support Spain because they are afraid that the workers might keep their arms, and turn them against their own bourgeoisie. It is obvious, however, the English proletariat would contribute more help if the proletariat of the Basque Country were to take action against the Catholic nationalists. And this is apart from the fact that the Basque reactionaries are sabotaging the struggle by negotiating an armistice over the bodies of the workers…. ‘Without the world revolution we are lost,’ Lenin said. This is even more valid for Spain: but in order to spur the world proletariat on to insurrection we must proceed with our own example. In order to make the French proletariat break with the reaction it is necessary to first liquidate the policy of the Popular Front of our leaders and oppose it with the Revolutionary Front of the workers…. At a time when the Spanish proletariat is being driven backwards, its struggle is not yet lost; it is only a stage in the international confrontation between capital and labor. There are periods of advance and retreat, but the victory of the proletariat is assured. The obligation of the revolutionary workers is as follows: they have to persevere without vacillations in pursuing the goal of the liberation of their class, without ever losing sight of this goal. Everything must be subordinated to this goal. One of the first preconditions for the development of the struggle in the proletarian-revolutionary sense is that the proletariat should become conscious of the need for an autonomous class struggle. In order to achieve this we have to unmask the ideologies of all the organizations connected with the Popular Front and this must be our first task and most urgent priority. The revolutionary workers must never forget the pernicious nature of the policy of the Popular Front. In this connection we must proceed to unmask the CNT and the FAI, both of which are supporting the Popular Front and the bourgeois reaction. The events of May have once again exposed the bankruptcy of anarchosyndicalist principles. At the very moment when the struggle between the proletariat and the bourgeoisie was starkly highlighted, the CNT openly displayed its bankruptcy. At the very moment of the joint attack by the forces of reaction, when the militants of its ranks expected a clear response to the dilemma of whether they should put down their guns or not, the CNT allowed itself to be seduced by political elements and thus helped to break the resistance of the workers. The CNT is one of the main culprits in the suppression of the uprising since, at the moment when the proletariat went into action against the democratic reaction, the CNT demoralized it. This position of the CNT is proof of this organization’s break with the revolutionary class struggle and its increasing complicity with the Popular Front and with capitalist reaction. But we must in any event clarify the causes that led the CNT to take this position. It would be an error to claim that the CNT’s sudden rise to power led to a vulgar kind of “betrayal”, transforming the CNT into a force against the workers revolution. It would be just as wrong to maintain that the CNT’s stance was not consonant with the will of the majority of the working class. Just the opposite is true, the CNT adapted to nothing more than the aspirations of the great mass of the Catalonian workers, who certainly wanted to wage the struggle against fascism and for their liberation to the very end, but who were not sufficiently aware of social problems, nor could they distinguish the revolutionary struggle from reformism, bourgeois democracy from proletarian democracy, or capitalism from communism. The CNT was able to shepherd their views thanks to the vacillating and immature opinions of the proletariat. Furthermore, the non-revolutionary consciousness of the workers characterized them as class traitors because the fear of Franco sapped the strength of their struggle against the “democratic” reaction. They could just as well have acted in opposition to their organizations but they had internalized their conceptions. There are many reasons and causes that explain this attitude, not in terms of its results but its roots, and that is where we have to focus our attack. The CNT, however, which embraced millions of workers, the only revolutionary organization with a presence throughout all of Spain, the organization that on July 19 practically represented the entire population of the Catalonian working class, had never been a real class organization at all. The CNT had always categorically rejected all politics, condemned all state and party dictatorships, and now it is floundering in the schemes and plots of the governments and political parties, and is being extinguished as a revolutionary organization. The contradiction between theory and practice seems to have become more acute but this is only on the surface. The critiques of the foreign anarchists, who see the CNT as traitors, have never advanced beyond this point. While the CNT could by no means proceed with absolute disregard for its principles, it had to form an alliance with the other combatant forces. It was precisely its anarchist principles, its illusions, as well as the organization that embodied the struggle of the workers, that stood in the way of the effective preparation of a class organization and instead drove it into the army of the bourgeoisie, where it met its destruction as an organization of struggle of the revolutionary classes. This observation is typical of the entire anarchosyndicalist movement to this day. In the view of the Spanish anarchosyndicalist movement, communism is an affair of control over production by the CNT and the directive role of the trade unions themselves, and therefore not the work of the working class as a whole through its own Council organizations. This idea proposes that a trade union, by virtue of special circumstances, will remain combative and not degenerate into reformism, but this does not bring it any nearer to reality. This is how the CNT perceives the dissolution of the differences between social democracy and anarchism in a united front of the organizations. The goals of the two organizations cannot change, however. Which policy will direct this united front, social democratic or anarchist? The social democracy, at this juncture, is considering “more revolutionary” measures, maybe even total nationalization of the economy, when in practice it sabotages every attempt to transform economic life. The anarchists are in principle in favor of the abolition of state power and want to carry out production under the direction of the trade unions, which they believe will be the cardinal point for an autonomous working class power. A pact between this working class power and social democracy is impossible, however. In the case that such a pact between social democracy and anarchists were to be implemented it would therefore be necessary for this notion of working class power to have a different character than the one it was originally given. And this is in fact the case. It signifies nothing more than yet another series of concessions by the CNT to social democracy with its subordination to the existing bourgeois “democracy”. The necessary consequence of all of this is the fact that now that the trade unions, which already possess a more or less bureaucratized apparatus, shall soon be complemented with the expansion of the state apparatus, the working class base will be completely pushed aside and will disappear as a superfluous encumbrance. This is how the pact between social democracy and anarchism looks, not like an accord between the CNT and the UGT, but as a complete victory for the social democracy and the bourgeoisie. But the CNT cannot understand this. In its opinion you have socialism when the trade unions take over the direction of production. Why should we concern ourselves with the different political tendencies? Production under the joint direction of the two trade union federations is simultaneously the starting point and the goal of the revolution. This is its concept of communism. All the rest is a matter of technical details and nothing more. There will be constant political debates but unity with all the politicians will not endanger joint control by the trade unions! Only when the social democrats want it to be, then everything is in order! Events were to resolve this question in a horrible way for the anarchists. The anarchists do not understand that the power of the revolutionary class can only be dictatorial. It is true that the unity of the working class is necessary, but it is precisely the clear intent of the pacts between the organizations to prevent the achievement of the unity of the revolutionary class. No kind of unity is possible with social democratic conceptions, which leave power in the hands of the bourgeois state, while the workers are preparing for war. Each lapse leads to another setback, and these revolutionary thinkers adopt the slogan: “All power to the proletariat”, as a starting point. When the working class is organized in a revolutionary struggle, then it just so happens that power is handed over to a Popular Front Government even though the latter has no arms, and even though the working class exercises all power. The organizations and parties as well as the trade unions embody the different political currents that exist in the working class and are linked to capitalism and led by the policy of the bourgeoisie. And in the revolutionary struggle the workers certainly have to face new problems. These problems can only be solved on the basis of the requirements of the moment, and imply a vast transformation in the minds of the workers, and the old organizations in the war of ideas wage a struggle to reinforce dogmas and abort the spiritual renewal of the workers. This is also another reason for the workers to get rid of these organizations, because they pose a threat to the revolution as much in the field of ideas as in that of material life. 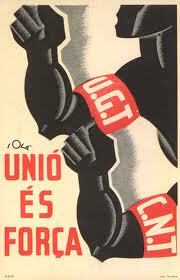 Instead of a pact between the CNT and the UGT they should issue the directive, “All power to the Workers Councils”. The workers must exercise power immediately, and not allow themselves to be tricked by a bureaucracy, which is increasingly pushing them aside. Their spiritual liberation from the embrace of capitalism can for that very reason only be the outcome of their own efforts. It can by no means by realized by backroom deals and pacts between bureaucrats. These tasks are of the utmost importance for revolutionary organizations, because they break with the paralyzing influence of the old organizations. They transform the struggle between organizations into a struggle of ideas that will not take long to criticize not their origins, but exclusively their value for the revolution. And for that very reason they embody, where insufficiencies appear, the spirit of the struggle of the liberation of the proletariat. “… With clear awareness of the circumstances of the moment the CNT renounces a rapid realization of its own goal, libertarian communism. Nonetheless, it is laying the foundations for the collectivization of large and medium-size enterprises in the hands of the working class trade unions and for the gradual replacement of the old state institutions by new economic, political and cultural institutions under the control of the working class trade unions. Even before July 19 the CNT made it clear that it could not carry out these tasks alone, and explained that for the achievement of these goals the means was the revolutionary alliance between the anarchist and socialist trade unions. It is on this basis that the CNT is participating in the pact. Although the UGT did not exist in Catalonia until after July 19 and became a safe refuge for the backward layers of the working class and the entire petty bourgeoisie….” (from the same AIT Bulletin). “… We see things as they are, not through rose-colored lenses, without doctrinaire taboos. This is a revolution and not a learned discussion concerning this or that principle. Principles should not be strict commandments, but flexible forms for understanding and confronting reality. Does our platform guarantee the attainment of Libertarian Communism at the moment of the revolution? Of course not. It does, however, guarantee the break with capitalism and the annihilation of its ally, fascism. It guarantees the construction of a proletarian regime, democratic and without exploitation and class privileges, a regime that will be an open door for a free society in the fullest sense of the term….” (German-language Bulletin of the AIT, May 11, 1937). Here the anarchist confusions reach their highest point. They are shared by both the CNT and the AIT. What are the concrete perspectives of this struggle? Not libertarian communism, but the annihilation of capitalism, the construction of a proletarian-democratic regime without exploitation or class privileges. But if this is not yet libertarian communism, what else can it be? We have always been of the opinion that with the abolition of the capitalist mode of production and of exploitation in connection with the realization of proletarian democracy, communism is realized. Apparently we have gone astray. Or is it rather the case that the CNT understands the terms proletarian democracy and abolition of exploitation to mean something different? In view of the CNT’s practice the answer is not hard to find. What all this means to the AIT is a minimum program, which we can recognize in current practice. Proletarian democracy? Its proletarian democracy is the vulgar proportional representation of the trade unions in the Government, as well as the erection of an impediment to revolutionary unity by the creation of an appearance of unity. Representation through compromise and the struggle of the competition between views. Abolition of capitalism? Its abolition of capitalism is the vulgar expropriation of the capitalists but without resulting in the workers obtaining economic power over the enterprises. Abolition of class privileges? Its abolition of class privileges means that the workers organizations must take their seats in the Government alongside the bourgeoisie while they keep the profits of the expropriated owners. Abolition of exploitation? By this it means the mere abolition of private capitalists, and the handing over of control of production to the trade unions. Since the trade unions are bureaucratic organizations, however, in which the influence of the workers is disregarded and whose practice has been consistently demonstrated in Spain (see Rätekorrespondenz, no. 21), this means that the workers surrender both their right to determine the production process as well as the means of production into the hands of a bureaucratic organization separate from them. This implies that above the workers there is a ruling layer that controls production and distribution according to its whims. It means that the workers, instead of being exploited by private capitalists, will be exploited by the trade union bureaucracy. It will therefore be necessary to constitute a new form of state rule, since up until now no form of exploitation has been able to exist without a state. These are the programmatic points that guide the CNT’s actions in its concrete actions. Since this is its minimum program, they are certainly correct to point out that this is not libertarian communism. But then they make a serious mistake when they maintain that it is an open door to libertarian communism. With the help of this organization they want to erect a proletarian democracy, destroy capitalism, abolish exploitation and do away with classes! The counterrevolution includes the remnants of the bourgeoisie, professional politicians, parliamentarians, officials of the reformist organizations, communists, as well as the Esquerra, PSUC, UGT; in short it includes all those who hold positions on the committees and belong to the trade unions and parties, whether the Esquerra, the PSUC, the UGT, or the CNT-FAI. How can they stand alongside the Stalinists, social democrats and bourgeoisie? Are they revolutionaries or counterrevolutionaries? Apparently they are revolutionaries on the committees and counterrevolutionaries in the Government. Nonetheless, they pursue the same policies in both places…. Besides, the constant series of concessions the anarchists have made and will continue to make to leaders and organizations that they define as counterrevolutionary are well known: “… The CNT … sacrificed many of its demands to antifascist unity, which was considered by many revolutionary workers as unacceptable. The masses of the CNT maintained discipline and clenched their teeth….” (see the Bulletin quoted above). The anarchists surrendered one of their most important positions in the interest of unity without getting anything in return and cutting themselves off from the world proletariat. And they did so in favor of a “unity” that can only exist on the condition of the absolute defeat of the fighting proletariat. And at the same time these same anarchists explain that: “… For the revolutionary workers of Spain support the defense against fascism only in the sense that it is at the same time connected with the struggle against the capitalist system….” (see the Bulletin quoted above). We must repeat, however, that the opposition between these declarations is merely apparent. In reality the CNT advocates a kind of harmony in terms of which capitalism and communism, revolution and reformism, have a different meaning than they do for us. For the CNT the revolution is nothing more than ownership of the economy by the CNT and communism nothing more than the direction of production by the trade unions. Once it has assumed such a position, then the CNT will only yield to the reasonable nature of insignificant concessions that in reality represent a complete capitulation to reaction. In the light of the above analysis, the behavior of the CNT during the May Days should not be at all surprising. We should recall the penetrating manifesto of the Libertarian Youth against the Popular Front policy that displays all the wit of the Spanish people. This is a part of the anarchist movement that finds itself in the midst of a revolutionary struggle and is torn by the opposition of revolution and counterrevolution. For the CNT there is no such problem, it has become over the course of the last few months a part of the government apparatus. Its committees are part of the state. Its men have settled into ministerial positions and others have high positions in the army. But they do not feel (naturally) that they are the executors of the will of the workers but of the ruling regime. The Government crisis in Catalonia, the appointment of a general from the Central Government as the commander in chief of the troops of the Catalonian militias, and the attempt to seize the Telephone building are merely minor incidents in their eyes. They resisted these maneuvers and approved of the resistance only in order to capitalize on the resistance within the framework of the government; but they did not proceed any farther because they could not control the resistance, and because these measures were only partial actions in the context of a major offensive on the part of the bourgeoisie in its efforts to disarm the working class. The anarchists preserved their “good reputation” by relieving the “provocateurs” of their positions, who were replaced with other officials for the purpose of maintaining order. And then the CNT called upon its supporters to put an end to all their actions. The incident was forgotten by them, while the counterrevolution was victorious. It would seem, however, that in the end the CNT has learned nothing. “… We are authorized, we shall point out, by neither the CNT nor the FAI. Nonetheless, like any other responsible organization they would have been put down, too, if they were to break the anti-fascist front or engage in any attempt to bring about such a break…. “The trade unions and anarchist organizations always work loyally, as they have up until now, with all the trade unions and political factions of the joint anti-fascist front. This is demonstrated by the fact that the CNT has fully collaborated with the Government of the Republic as well as with the Generalitat of Catalonia, as well as in all the municipal bodies. When the conflict was provoked in Barcelona, the CNT had everything to gain at a regional and national level, but rapidly acted in such a way as to break up the conflict. On the second day of the conflict the secretary of the National Committee of the CNT and the Minister of Justice, also a well-known member of the CNT, arrived in Barcelona, and issued appeals through every possible channel for an end to the fratricidal struggle. Proceeding along the same path as the other political sectors, they directed at the population of Barcelona the arguments that everyone is familiar with. They made it clear that they were only speaking sincerely and in the interest of the unity of action against the common enemy: fascism. “The secretary of the National Committee, Mariano Vázquez, in his speech at the Generalitat on May 4, said the following: ‘… We have to stop what is happening here. We have to stop because our comrades at the front know, we have to keep focused on the realities of the present moment and, because they know, that we understand that we stand together. At no time must we cause a sense of insecurity in the rearguard, we must not give any comfort to fascism. Cease fire, comrades! But no one should take unfair advantage of the truce, or seize new positions. We meet here and while we discuss what is necessary, but we shall find a solution, an agreement among all since that is our obligation. Because our sense of self-preservation leads us to act responsibly, and around these points all the antifascist forces must reach an agreement in the Generalitat. We are gathered here, and especially the Executive Committee of the UGT and the National Committee of the CNT, we have arrived as soon as possible, and we encounter a difficult situation in Barcelona, and that is why we have to reach an agreement in order to bring this situation to an end. We have to find a point of common agreement, and that is why we have called for a cease-fire, so that our only common enemy, fascism, cannot take advantage of the situation.’” (From the same issue of No. 44 of the Bulletin of the AIT). “Cease fire, comrades!” This is what the leader of the anarchists proclaimed from the palace of the Generalitat, which the anarchist revolutionaries had surrounded. “Put down you guns!” As we already mentioned when we made reference to the special accommodation made between revolution and counterrevolution. The confederal press issued various appeals for a return to work. Over the radio instructions were given to the trade unions and the defense committees that only called for responsibility and calmer tempers. Just another example of the fact that the CNT did not want to break with the antifascist front, was the fact that it made possible the formation of a new Catalonian government on May 5, a Government in which the regional secretary of the CNT participated. “We are qualified to explain, after the fact, that the CNT and the FAI will under no circumstances respond to open violence, even if the agreements with the state and the Generalitat are broken. No member of the CNT is to respond to the ‘first shot’. “The responsible men of the Confederation occupying the highest offices of the Council of Defense, have given orders to all the forces under the authority of the Council, that they must not take part in the conflict in any way. And they are also taking measures to assure that these orders are obeyed. “The responsible comrades of the confederal defense committees of the CNT and the FAI, have issued the directive that no one is to leave their assigned zones and that no one is to respond to provocations. These orders were enforced everywhere. “The Regional Committee of the CNT-FAI has disseminated a directive throughout all of Catalonia ordering everyone to remain at their positions and that no one is to disturb public order anywhere at all. “As we have seen, normal life was reestablished, and it was the CNT and the FAI that were the first organizations to call for collaboration, the first to issue the cease-fire directive. Since the central Government agreed to assume control over public order, the CNT was the first organization to place reliable forces at its disposal. As the central Government agreed to send forces to Barcelona, while the control patrols were dissolved to further weaken the CNT. And it was the CNT that was the first to help secure the route for the Government forces through the Catalonian counties and made it possible for those forces to reach Barcelona.” (See issue no. 44 of the AIT Bulletin). Workers democracy! The slogan of the CNT. It secured its program by way of its alliance with the UGT. But what does this really mean? Ministerial conferences, appeals to put an end to the fighting, prohibition of the freedom of movement of the workers, facilitating the transport of troops to Barcelona, limitation of the prerogatives of the control patrols. And the workers have to obey the directives of Vázquez and señor Largo Caballero and the terms of their mutual agreements. And then: Obedience! No opposition, and under no circumstances must there be armed resistance. No discussion. This is how the CNT defends workers democracy! This is how it defends the revolution! But once again this is the logical consequence of the whole evolution of the CNT and of its ideas. This is what workers democracy means. It is more than just equal representation of the organizations! Then the pact with the UGT must be preserved regardless of the cost. The general secretary of the CNT, Vázquez, called for an end to the fighting. Since he personifies the Catalonian proletariat, what more could the workers want? Their representatives are carrying on discussions with Largo Caballero; is this not the best guarantee that their rights will be respected? The workers of Catalonia can stay home and relax; Vázquez will save both democracy and the revolution. Once again it was proven that the anarchosyndicalists are incapable of seeing the class struggle as a class struggle. The episodes are presented as a mere struggle on behalf of this or that organization. Although they claim that: “… In those parts of the city where barracks and police stations and headquarters of the republican and Marxist militias are located, they either joined the workers, as was the case with the police in Sants and Sant Gervasi, or else they declared their neutrality, as was the case of the soldiers in the communist barracks of Sarriá…. The old police forces, the Marxists and the republicans, on the other hand, maintained control over the bourgeois neighborhoods and the old downtown, where the government and municipal offices are located….” (From the same Bulletin). Only one adjective suits these hucksters of the CNT: criminal. The workers who assaulted the barracks of the reactionary Civil Guard certainly did not do so in order to release their prisoners. They surrendered the police to the CNT, and the CNT released these armed fascists and monarchists! Was this perhaps the price that had to be paid for its ministerial suites? At the same time, the militants of the CNT were being arrested en masse! And this fact seems to be of secondary importance to the CNT since they expect that the “Next few weeks will show just how loyal the new commanders are…”. Is this not the position that the bourgeoisie possesses thanks to the CNT? And hasn’t the working class lost too much in this way? The explanation for this deplorable behavior is the fear of Franco. The fear of Franco leads the CNT to surrender the working class to “Democracy”, which seeks to put an end to the struggle against Franco by means of a compromise. This is the same “democracy” that holds back arms from the Aragón front, that throws the revolutionary workers into prison and protects the traitors of Málaga. It is this “democracy” that once again reconstructs the reactionary Civil Guard and takes fascist spies under its protection. And it is to this “democracy”, to the allies of international capital, that the CNT wants to surrender its power because it is afraid that Franco will win. This is nothing but the practical embodiment of the counterrevolution; workers, you must oppose not just Franco but the CNT as well, or else you will be surrendered to the blackest reaction. There is only one hope and one chance for the working class, and that is the unconditional struggle against fascism and reaction. This is what the CNT has forgotten! In Bulletin no. 45 of the AIT an important discovery concerning the nature of the Government is disclosed: “… For several months now it has become evident that the largest working class organizations (the CNT and UGT) are being displaced from the management of public affairs. This has been demanded by the camouflaged counterrevolution and the foreign powers that the counterrevolution serves, and they have attained their goal. The camouflaged counterrevolution demanded it, and the CNT discussed the matter and obeyed. “Spanish antifascism is sinking, rudderless and without direction, it is unfortunate but we have to proclaim this fact loud and clear. Many beneficiaries of this situation want to make a course change to the right and as rapidly as possible to obtain an armistice, which would not be a victory over fascism….” (Bulletin no. 45). The CNT, which has always maintained that “it represents the real Catalonian people and authentic antifascism” thus admits its impotence, when Spanish antifascism has lost its rudder and its direction. This means no less than that the CNT has not successfully measured up to the circumstances, that it is incapable of fulfilling the tasks that it had proposed to carry out. “… They want the future of Spain, the future of the proletariat, its blood spilled in combat, to be sold cheap. Sold cheap to international democracy and international fascism. But the proletariat has not fought for the defense of a fake democratic republic, but for the victory of the revolution, for a new life, for the moral and economic transformation of the country. The counterrevolution cannot tolerate the advance of the masses for much longer, since the latter are ready to fight bravely, but only for themselves, mistrusting those who really only want to return to the past. This is the key to understanding the events of Barcelona, the leading city of the revolutionary Spanish proletariat….” (Bulletin no. 45). And who helped to halt the advance of the masses? The CNT!!! But now, when the fiasco of the position maintained by the CNT is evident, it cannot retrace the steps it has taken up until now. Its entire organizational apparatus is now dedicated to the attempt to ensure the administration of the economic means of life by the trade unions. It cannot relinquish this. This is why the CNT now proclaims the watchword of cooperation with the UGT. “… Now everyone with the CNT-UGT Alliance. Now: Workers of Spain, Unite!...”. (Bulletin no. 45). Of course, unite, but not in the CNT-UGT alliance, which would be an alliance with the counterrevolution! Anarchosyndicalism has demonstrated its uselessness! Translated in November 2013 from the Spanish translation. Translated from Dutch to Spanish by Joan Carles Gelabertó.